The LaPerm is a medium-size cat with a curly or wavy coat that can be short, medium-long or long. On the body, the curls might fall in tight ringlets or long corkscrews. Tighter curls appear on the throat, belly and base of the ears. In shorthairs, the tail resembles a bottle brush; the longhaired variety has a curly plumed tail and a full, curly ruff on the neck. LaPerms can be found in an infinite variety of coat colors and patterns, ranging from solid colors to shaded, tortoiseshell, chinchilla, smoke, tabby, pointed, bicolor and calico patterns. The head is a slightly rounded modified wedge shape topped with slightly flared medium to large ears. Expressive almond-shaped eyes come in copper, gold, yellow, green or blue. Eye color isn’t related to coat color. The people-oriented LaPerm loves to sit in a lap, but when that’s not an option, this investigative cat is exploring its surroundings and making sure that it’s a part of anything that’s going on. It’s generally a quiet cat who enjoys giving kisses and riding on a shoulder so it can keep an eye on everything. The LaPerm is generally healthy. Longhaired LaPerms need weekly grooming; shorthaired LaPerms need to be groomed every few weeks. Kittens may lose their coat as they mature, then develop their curls. The LaPerm, named for its soft, curly coat, sprang from a genetic mutation that was first seen in a litter of barn kittens in 1982. One of them was born hairless, but the pattern on its skin resembled that of a classic tabby. 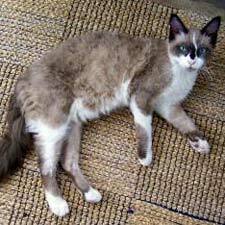 The kitten didn’t remain bald but started sprouting a curly coat at 3 to 4 months of age. The unusual bald kittens began to appear in future litters, and eventually the owner of the cats started to breed them selectively. Today, the LaPerm is a recognized breed registered by the Cat Fanciers Association (CFA) and The International Cat Association (TICA), as well as the Traditional Cat Association (TCA) and United Feline Organization (UFO). Both CFA and TICA currently permit outcrosses to domestic shorthairs or longhairs.